A class confrontation at the Epsom Derby of 1920. Three European empires have just vanished and the Troubles are raging in Ireland, but George V, the King-Emperor, drives to the Derby at Epsom in 1920 without a single policeman or security man in view. 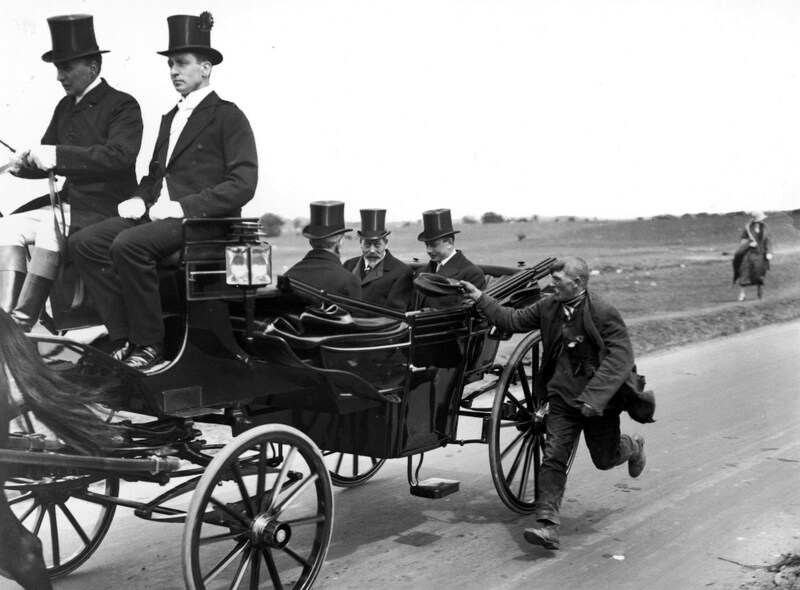 A beggar is able to run alongside the carriage and thrust his cap under the nose of Prince Henry, the Duke of Gloucester, one of the King’s sons. The medals just visible flapping on the man’s chest tell us he is an old soldier, so perhaps that is why the King and his companions show no alarm, guessing he is harmless. (There will be increasing numbers of jobless war veterans as the post-war recession bites.) But there is no sign either that any of them is reaching for a coin to throw into the cap. Monarchs, as we know, do not carry money, and perhaps the King is conscious that he must watch his spending – the deficit on his Civil List income this year is £45,000. Besides it is not long since he personally gave £100,000 towards the war effort. At a quick glance this could be a picture from twenty years or more before. Only when we notice the woman walking in the background, her skirt well above her ankles, are we alerted that it must be a post-war scene. Top hats, or "silk" or "tall" hats as their wearers call them, have been standard formal headgear for many decades. The coachman is in top boots and breeches, while the footman beside him on the "box" is in white tie, white waistcoat and cut-away coat, with a cockade on the side of his hat. The style of servants’ dress or uniform tends to be from many years earlier, to distinguish them from their employers. Although the war has brought a huge increase in the number of motors, the King still chooses to go by horse-drawn carriage. It is what is known as a landau, usually drawn by a pair of horses, with hoods folded down at either end which, when erected, meet in the middle. The doors have glass windows retracted within them. These can be hoisted by pulling on leather straps, as in old-fashioned railway carriages, to make the landau weatherproof. The King, Edwardian if not late-Victorian in his tastes, will continue to retain as much of the old elegance as he can. In 1913 on the morning after the death of a suffragette who had flung herself in front of his Derby runner, an equerry sent him a note: "Inquiries are being made as to whether Your Majesty is going to wear a tall hat at Epsom today." The King wrote at its foot: "Who are the damned fools? A tall hat is always worn at this meeting at Epsom."